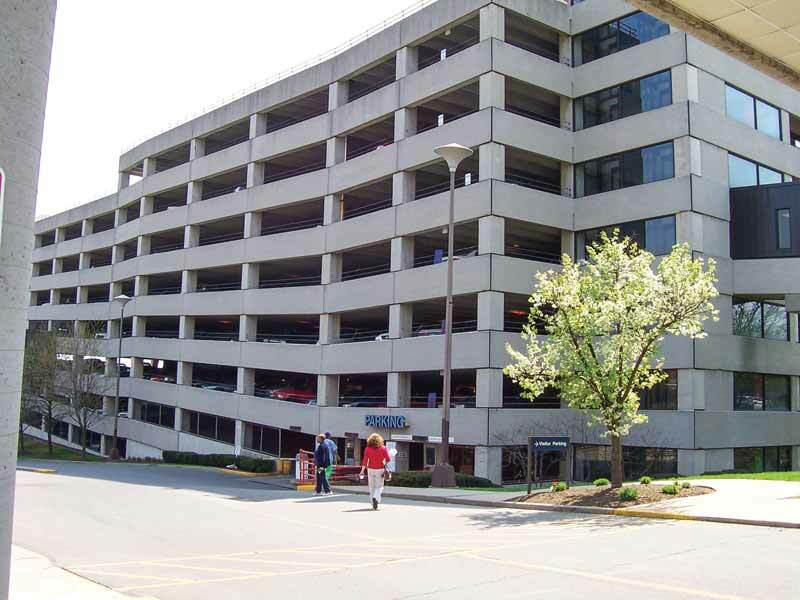 Parking garages are utilitarian structures designed to hold a large number of vehicles at one time on a comparatively small footprint of land. They must be built to withstand large amounts of weight and vehicle traffic. Durability is key as parking garages are often located in busy metro areas where closure, repair, or reconstruction can be disruptive. Time, labor, and material costs for renovation are also prohibitive. These structures are generally made from reinforced cast-in-place or precast concrete, making corrosion one of the most common challenges to durability. Corrosion products cause the rebar to expand, putting pressure on the concrete and causing cracks. Cracks allow additional water, chlorides, or other contaminants to ingress and attack the embedded rebar, resulting in more corrosion. Corrosion on the rebar creates more cracks and eventual spalling, causing the concrete to fall off the surface of the structure, and eventually leave the reinforcing metal exposed. If not interrupted, the cycle eventually leads to structural deterioration and deficiency. Corrosive attack is more severe in certain regions. In northern climates subject to harsh winters with snow and ice, municipalities combat slippery roads and surfaces by using deicing salts. This harsh application of chloride to the concrete surface accelerates the corrosion process and instigates early repairs. 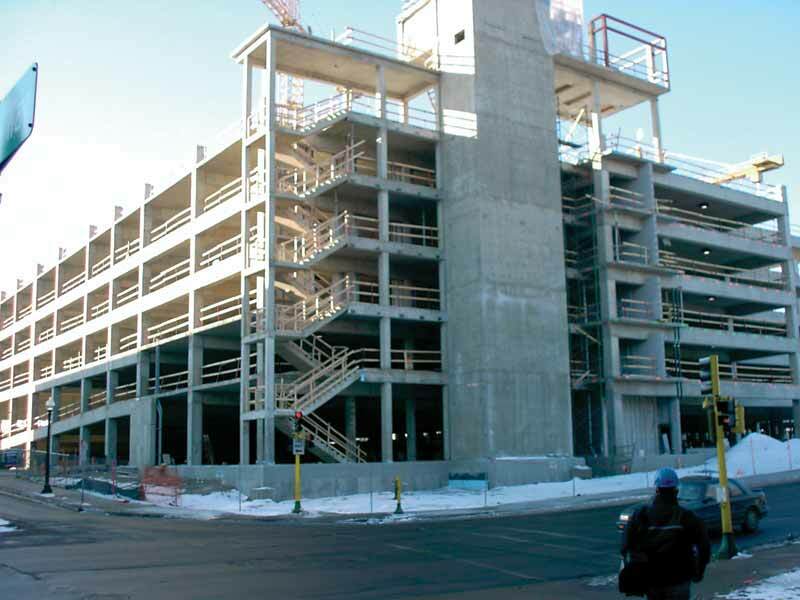 This six-level parking garage in Minnesota included a superplasticizer to increase concrete strength and workability. For corrosion mitigation, a migrating corrosion inhibitor was employed as added problems with cracking and strength were experienced in the first two decks that were treated with calcium nitrate (CNI). In coastal environments, concrete structures are attacked by salt spray and high temperatures, intensifying corrosion problems. In coastal areas in the Middle East, the corrosion threat is heightened by high groundwater tables and chloride-rich soils, endangering concrete foundations and requiring special design considerations to provide a long service life. 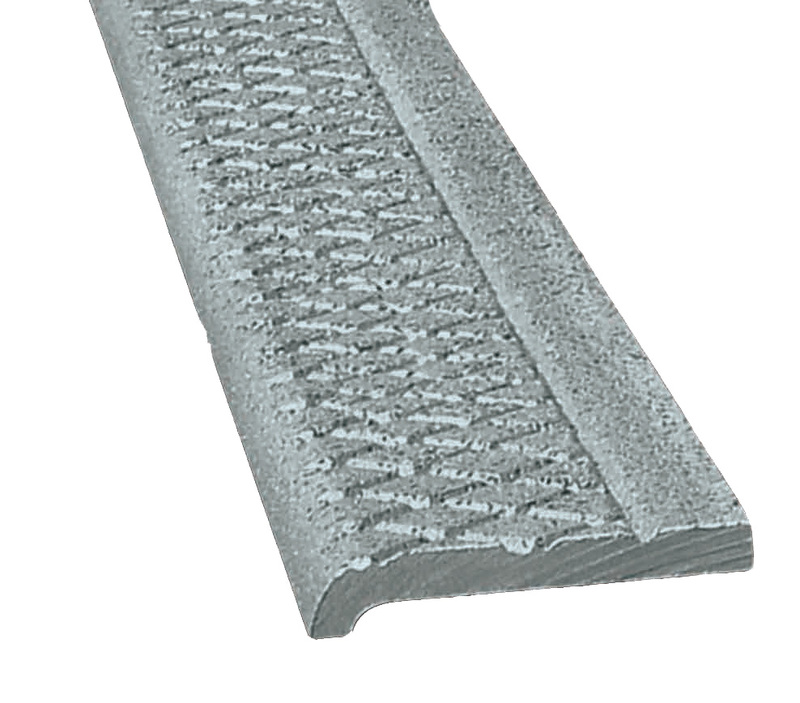 A variety of options exist for countering corrosion on both new and existing structures. Their cost and benefits should be weighed when selecting the right corrosion protection for the job. Another strategy employed in new structures is the use of calcium nitrite (CNI) admixtures. These raise the chloride threshold by competing with chlorides for a place on the surface of the rebar. Practically speaking, this means the structure must reach a higher chloride content before a corrosion site can be initiated. However, larger doses (up to 30 L/m3 [6 gal/cy]) of the admixture must be applied to counter the expected rates of chloride exposure. If the threshold is surpassed, corrosion can take place at the same or accelerated rates compared to untreated reinforced concrete. While this treatment can be effective at sufficient doses, it also causes some undesirable side effects. 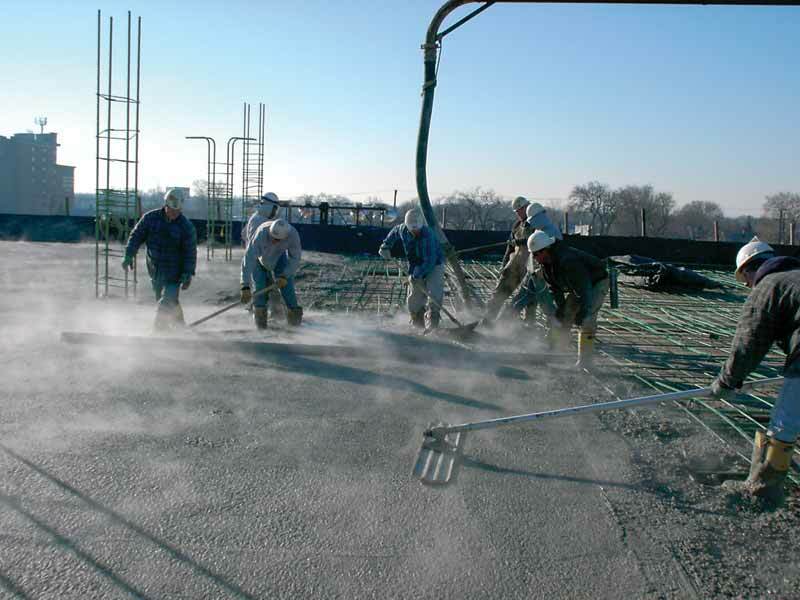 For instance, CNI admixtures accelerate set time and increase shrinkage cracking, making it more difficult to lay and properly finish fresh concrete. As dosage rates increase to compensate for higher chloride exposure, the shrinkage and set time problems are exacerbated, creating more hassle for both the ready mix company and contractors placing the material. CNI also raises health concerns because of its nitrite-based makeup. It is not considered acceptable for use in potable water structures. 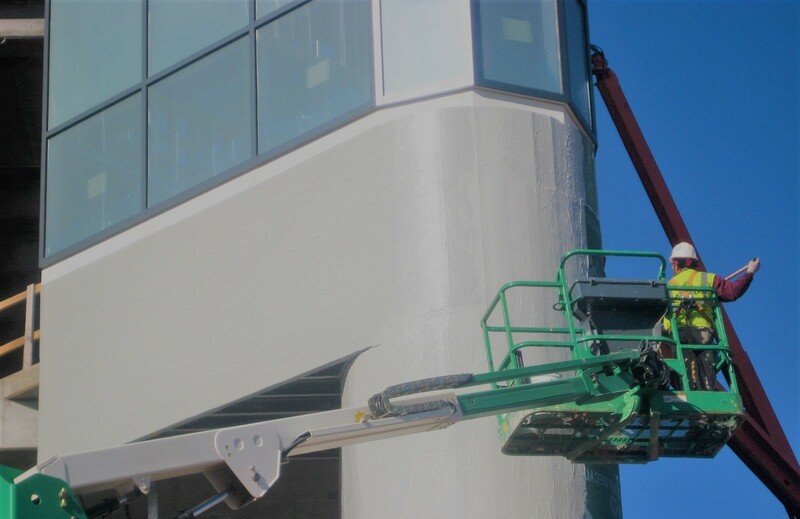 The superplasticizer/migrating corrosion inhibitor combination helped maintain good workability and finishing properties of the low-moisture concrete, allowing crews to stay ahead of schedule. Cathodic protection (CP) is another strategy for protection against corrosion. It can be accomplished by redirecting corrosion to a sacrificial anode, or by sending an electric current (impressed current cathodic protection [ICCP]) though the rebar to reroute the normal electrochemical corrosion processes. However, for full effectiveness of CP, all rebar must be continuously connected. 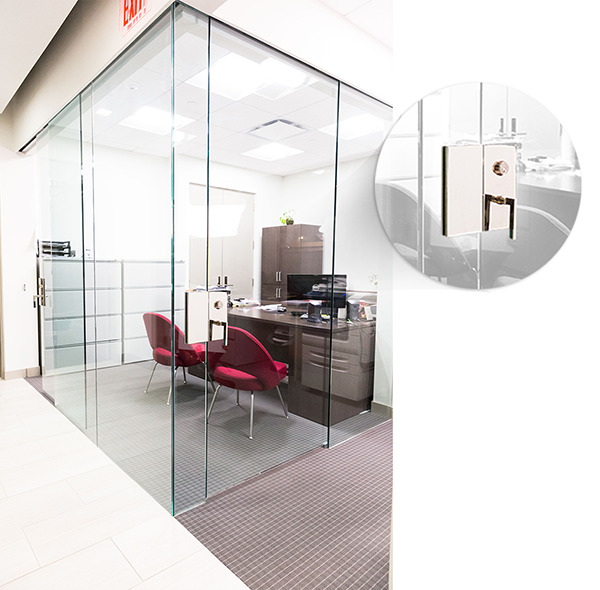 In the case of ICCP, the extra cost and maintenance of a constant electrical current has to be taken into consideration. Applying water repellents to both new and existing structures is a good maintenance practice. 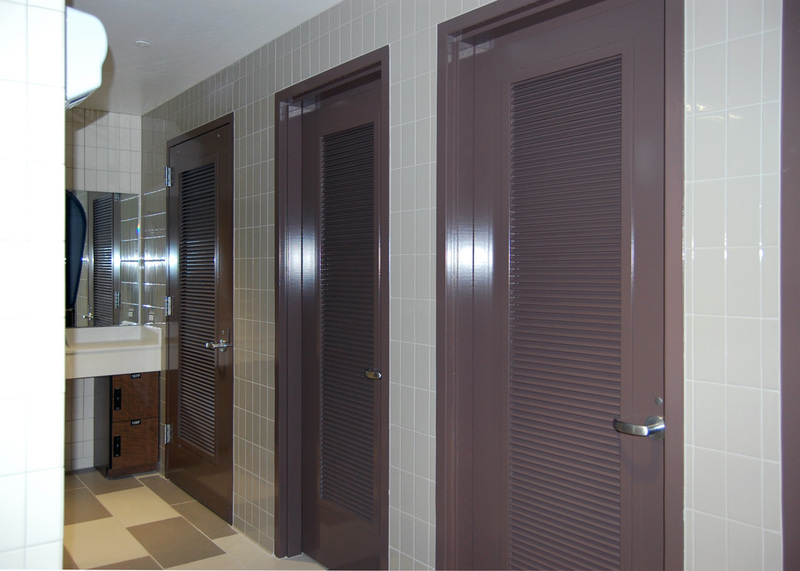 These materials discourage corrosion by significantly reducing moisture and chloride ingress into the structure. However, once the repellent layer is compromised, through age or cracking, corrosive elements can work their way to the rebar surface and initiate the corrosion reaction. You May Also Like What's wrong with my precast concrete garage? Migrating corrosion inhibitors are based on a blend of salts of amine alcohols (first generation) or amine carboxylates (second generation) with the ability to migrate through concrete and form a protective film on metal surfaces. 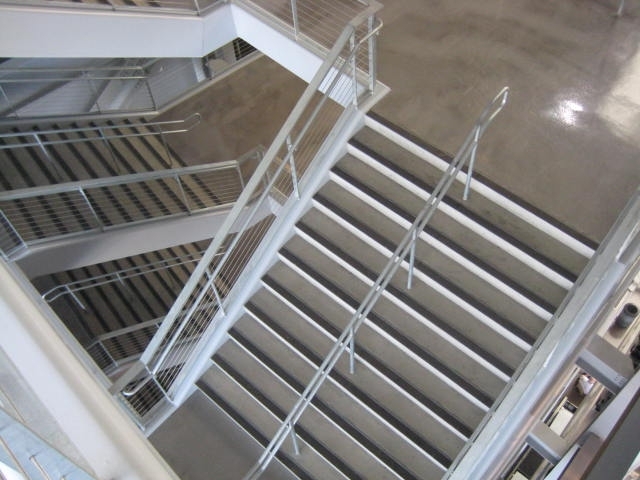 They can be admixed into new concrete or applied as a liquid surface treatment for penetrating existing concrete. The resulting molecular layer can act as a “mixed” inhibitor to protect against both anodic and cathodic reactions of a corrosion cell. 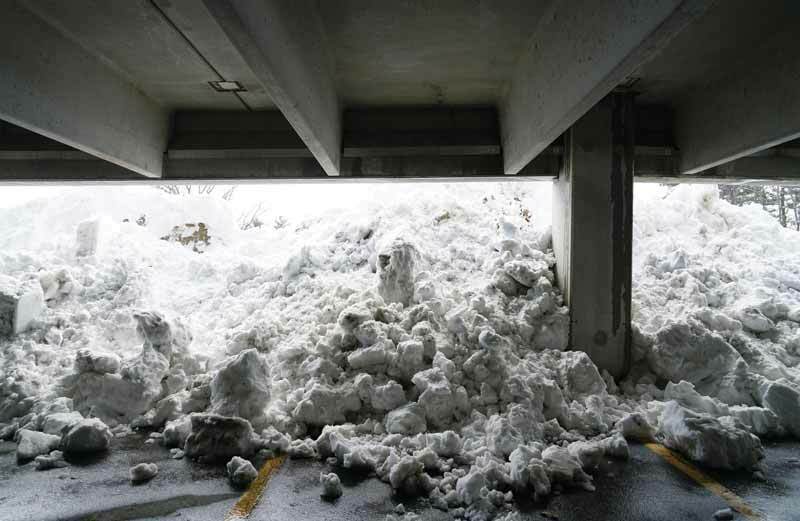 Parking garages in regions experiencing harsh winters face accelerated corrosion attack due to the heavy use of deicing salts. The difficulty of gathering data on new structures and comparing it to typically non-existent control (untreated) structures of the same type and environment leaves users mainly dependent on standardized test data to estimate the benefit a migrating corrosion inhibitor admixture has on a new structure’s service life. The process is simplified by using service life prediction modeling software. 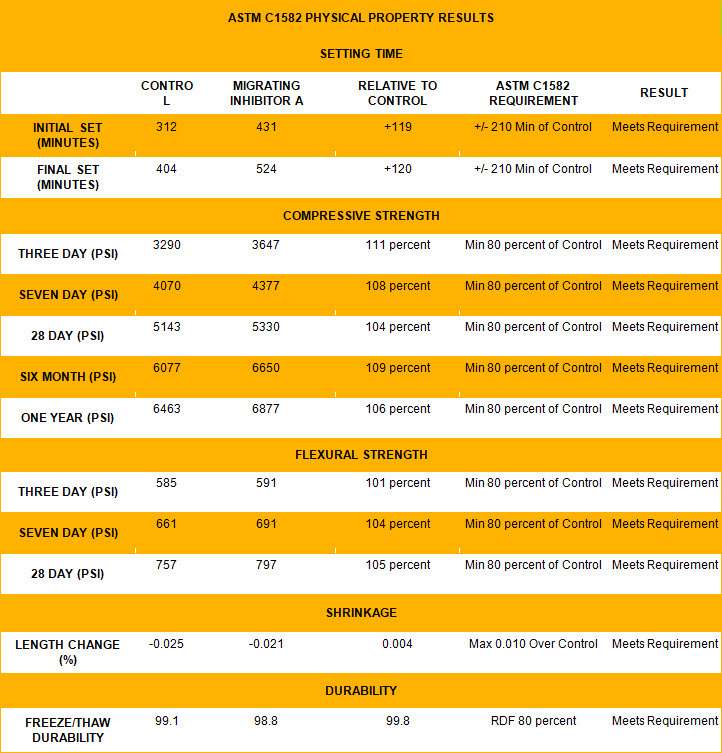 An accessible prediction software available as a free download has been developed by a consortium headed by the American Concrete Institute’s (ACI’s) strategic development council (SDC). The research-based model provides estimates of how design, temperature, chloride exposure, and other factors impact concrete’s service life. (See, “Organic Corrosion Inhibitors – New Build and Existing Structures Performance,” by J. Meyer for the Brian Cherry International Concrete Symposium held in July 2017.) Using inputs based on standardized testing of migrating corrosion inhibitors, engineers can predict an estimated design life for different concrete mix types and climates. The Princess Tower (the tallest residential-only building when completed in 2012) in the United Arab Emirates was able to upgrade from an estimated 48-year service life for a foundation that did not use inhibitors to a 103-year estimated service life with the use of Inhibitor A. This was at an additional cost of 0.07 percent compared to the rest of the tower’s construction expense. In this case, the modeling software predicted a doubled service life. Another software model involved a seawall constructed in 2017 on Longboat Key in the Gulf of Mexico. The software was used to help find a mix design with the ability to provide an estimated service life of at least 100 years. The first standard seawall mix input showed an estimated service life of 15.2 years before the first repair would be needed. The addition of Inhibitor A admixture tripled the prediction to 46.9 years of estimated service life before the first repair would be needed. Other mix designs were subsequently tried to find a combination that would meet or exceed the ambitious requirements of the project owner. Eventually, the team settled on a mix design that brought the estimated service life up to more than 100 years on its own. With the addition of Inhibitor A, this estimation increased to more than 150 years. Migrating corrosion inhibiting admixtures have a lot to offer when constructing new parking structures. 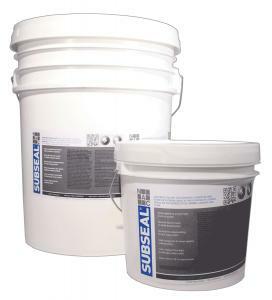 They tend to have minimal effect on concrete setting properties and allow good workability. Whereas the ASTM C1582, Standard Specification for Admixtures to Inhibit Chloride-Induced Corrosion of Reinforcing Steel in Concrete, requires admixtures meet at least 80 percent of the compressive strength of a control sample not containing corrosion inhibitors, testing showed that Inhibitor A was able to achieve more than 100 percent of the compressive strength of the control at three and 28 days, six months, and one year (Figure 1). Some versions delay concrete mix set time, allowing more time for finishing. However, they can also be prepared as normal set admixtures that neither accelerate set time (a problem with CNI admixtures) nor extend it. Both normal- and extended-set migrating corrosion inhibitor admixtures meet the physical property results regarding set time, compressive and flexural strength, shrinkage, and freeze/thaw durability of ASTM C1582. Also unlike CNI, migrating corrosion inhibitor admixtures of the amine carboxylate blend have been certified by Underwriters Laboratories (UL) to meet NSF International/American National Standards Institute (ANSI) 61, Drinking Water System Components for Use in Potable Water Structures. (For a listing, visit the Underwriters Laboratories (UL) Online Certifications Directory.) Many contain bio-based material (derived from corn), and one has officially been designated as a U.S. Department of Agriculture- (USDA) certified bio-based product under the USDA BioPreferred Program. (For more, click here.) Typical dosage is 0.6 to 1 L/m3 (1 to 1.5 pints/yd3), much lower than CNI dosage, which varies dramatically based on expected chloride loading. Figure 1: Both normal and extended set migrating corrosion inhibitor admixtures meet ASTM C1582, Standard Specification for Admixtures to Inhibit Chloride-Induced Corrosion of Reinforcing Steel in Concrete, regarding set time, compressive strength, flexural strength, shrinkage, and freeze/thaw durability. Data taken from the article, “Admixture to Inhibit Chloride-Induced Corrosion of Reinforcing Steel in Concrete (ASTM C 1582),” prepared by Tourney Consulting Group in Kalamazoo, Michigan, in April 2016.